Send a sample of your work (5-10 pages or the first chapter) with an estimated word count of the manuscript overall, and I will give you a firm quote, depending on the level of editing required. 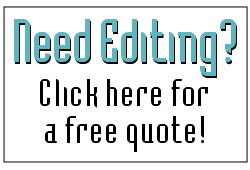 You may choose between a final proofreading or a more detailed, extensive edit. If you have questions please use my contact form. At the onset of the project, you will receive an estimated completion date. Meeting deadlines is a crucial part of the freelancer’s arsenal of excellence, and I take my deadlines seriously. Whether you’re looking for a quick proof or a more extensive edit, you and your work will be treated with respect. The work will retain your original voice and style, and you will receive honest and helpful suggestions and comments. It’s important that both author and editor see eye to eye – after all, this is your baby, and you’re entrusting it to a complete stranger. Feel free to send a few pages (about 1,000 words) for a free sample edit. You’ll be able to check compatibility, and you’ll get a more accurate quote on the entire project. Click here to receive a free sample and price quote. Your work remains 100% confidential. So do your name and address. Guaranteed. With the Microsoft Word tracking function, you can see each and every correction, giving you the power to accept or reject each change. It also saves you the trouble of manually correcting your own file copy. Comment boxes throughout offer more detailed explanations or suggestions, and at the completion of each project, I submit a separate document with notes and overall comments.